Bailey, a spirited gray and white Dutch rabbit, has been called many things, from a "grumpy" rabbit to a bit of a diva. But beneath all the attitude, what Bailey really wants is a friend. Bailey was found as a stray in a parking lot in Livermore, California, when she was just 3 years old, Joan Wegner, a volunteer with the East Bay Rabbit Rescue, told The Dodo. 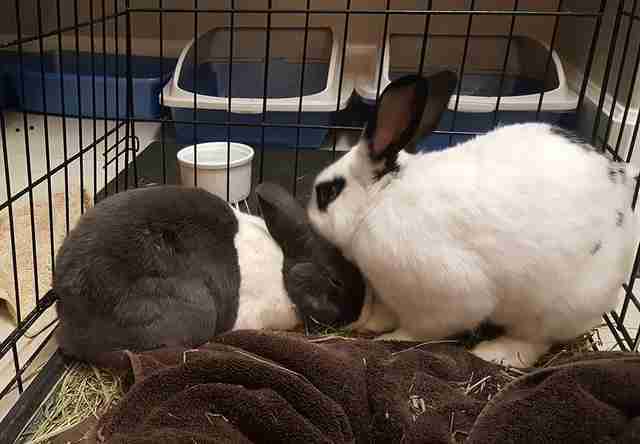 The woman who found Bailey decided to take her home and try to make Bailey bond with the two rabbits she already owned. However, the chemistry just wasn't there for Bailey - and despite her owner's good intentions, Bailey did not receive the best care. At the time, Bailey had not been spayed, which only added to her aggressive behavior. Furthermore, she was kept in a small cage that was not cleaned very often, as evidenced by Bailey's toenails, which were "crumbly," according to Wegner. So, the woman brought Bailey to East Bay. "By the time [Bailey's previous owner] called our rescue, Bailey really needed rescue - again," Wegner said. "We had her fixed, which often alleviates aggressive behavior, but she still didn't mellow." Staff at the rescue monitored Bailey for several months, hoping for an attitude change. But it didn't happen. 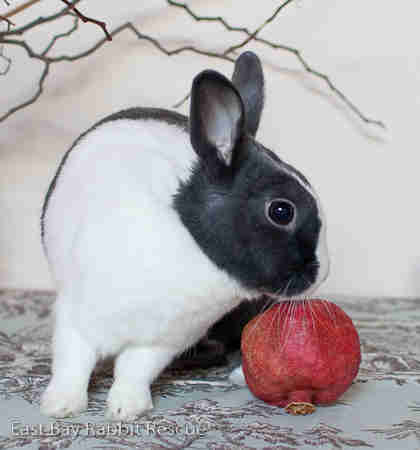 So, Wegner decided to put Bailey up for adoption, with the caveat that the rabbit was intelligent, but a little difficult. "Intelligent bunnies can often be a challenge. But they are worth the challenge too," she said. 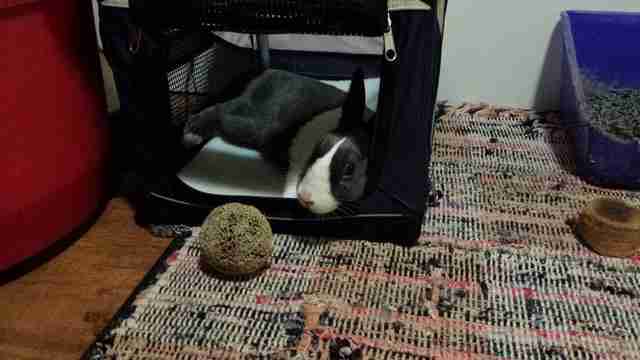 One day, a couple visited the rescue in search of a companion for their 11-year-old male rabbit, Sampras. 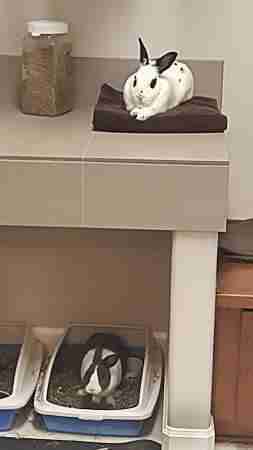 After scoping out a few adoption events, the couple warmed up to feisty little Bailey, and brought in Sampras to see if they would be a match. As it turns out, they were perfect for one another. "Bailey and Sampras did an instant bonding in one afternoon at [their] home," Wegner said. "The family never saw her difficult side." Sadly, Bailey's time with Sampras was far too short. They both spent a very happy two years together - and then, at the age of 13, Sampras passed away. "After they lost Sampras, Bailey became a little difficult [again]," Wegner said. "They were surprised to see a change in her behavior. They realized she missed Sampras as much as they did." 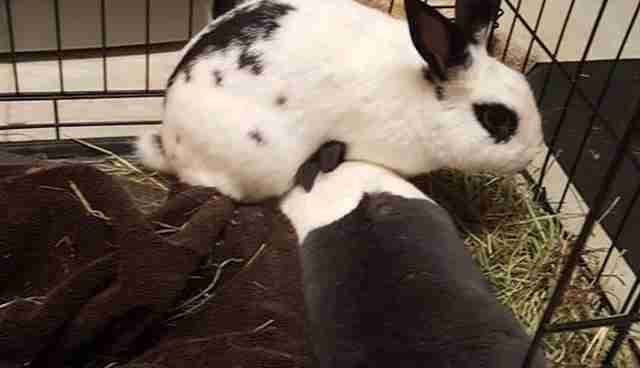 The couple, who had since moved out of California, decided to return to the state for one short weekend to see if Bailey could get her groove back with a new rabbit from East Bay. "We were happy that they were coming back and we made a special effort to get all of our eligible bachelors to the event," Wegner said. "We also support local shelters, so we brought as many boys as possible from some of the local shelters for Bailey to meet." It became evident that Bailey, who was picky, had a type - the only man good enough for her was one who reminded her of her first true love. "Bailey met a number of boys, but when she met a guy who looked a little like Sampras it was a done deal," Wegner said. 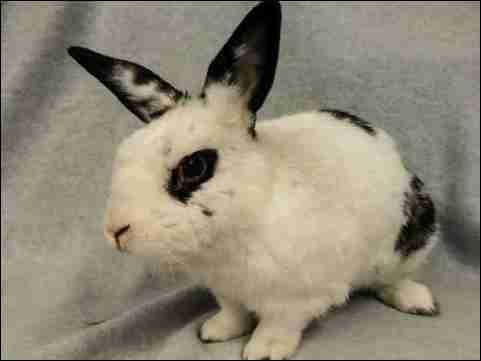 Jameson arrived at the Tri-City Animal Shelter in the summer of 2015, with several other rabbits. "All the bunnies in this group were beat up, urine-stained and a mess," Wegner said. "Life had been rough for them. And it takes time to recover. Jameson was a nice boy who was ready for a home." Bailey and Jameson are now living together as a bonded couple. Wegner said that, according to Bailey's family, her attitude's disappeared, and she's been transformed into a lover again. She seems to be content so long as Jameson doesn't wander far from her. As for Jameson, not only does he have a loving home, he's also gained a partner who will cherish him for the rest of his life. Bailey's definitely one of the luckiest (and now happiest) buns in the world. 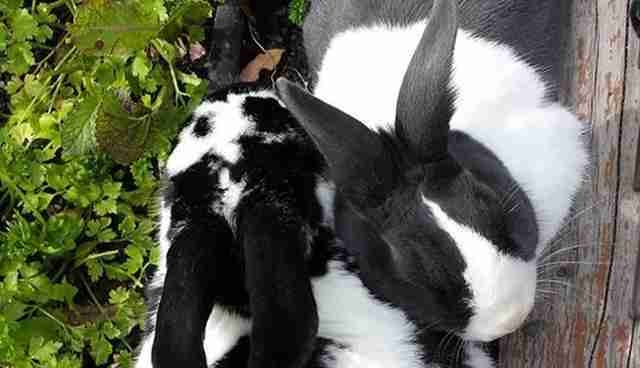 Want to help East Bay Rabbit Rescue continue doing good work for rabbits in need? Consider making a donation here. 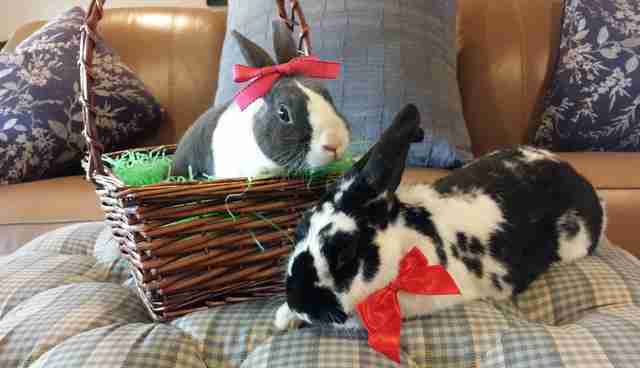 For more cute rabbit couples, check out this story about Betsy and Walter, who are the most stylish therapy bunnies you'll ever see.